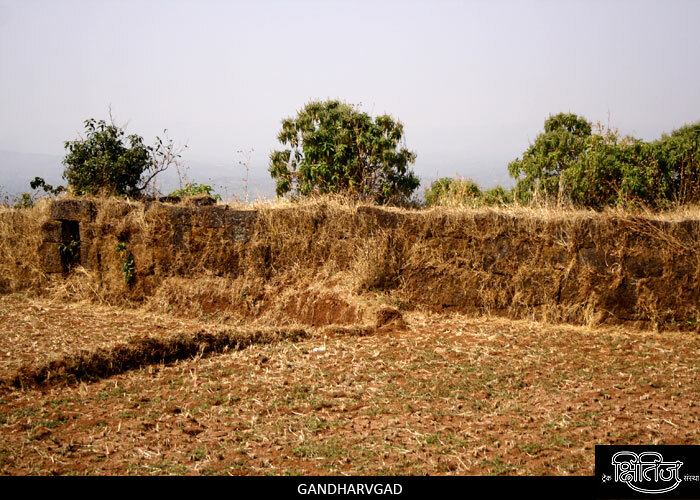 According to Sabhasad Bakhar, Gandharvagad is one of the 111 forts restored by Shivaji Maharaj. On 15 January 1666, Shivaji Maharaj went on to take this fort in the conquest of Panhalgad with an army of 5000. On 28 July 1687, Desai�s of Kakti Karyati and Hukkeri Pargana captured his fort from Marathas, for which they were promised the Deshmukhi of Ajamnagar / Belgaon and Chandgad / Ajra respectively. Adilshah controlled the fort for many years. Sadashivrao Bhau Peshwa stayed here for some time during his Karnataka campaign. Later the British destroyed this fort in 1844. We reach the fort in an hour from Valkuli village, which is the base village. On reaching the entrance, we see Hanuman on the right side of the road. There are residences on the fort. Further on this way is the temple of Lord Chaloba. Ahead is an ancient well, which has potable water. There is a ground in front of Chaloba temple, where there were remnants of old palace of the Sawant. Nothing can be seen now. In the eastern part of the fort, we can find some plinths. Then we can move to the southern side of the fort. The ramparts on the southern side are intact and spacious. There are 3 secret passages in the walls here.